Dine in tonight with Devour Tortellini Alfredo with Italian Sausage. 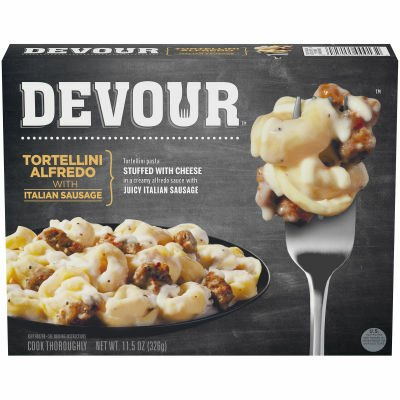 This frozen dinner includes tortellini pasta stuffed with cheese and topped with a creamy alfredo sauce and juicy Italian sausage. Ready in minutes, Devour Tortellini Alfredo with Italian Sausage is a satisfying and filling weeknight meal that's full of flavor and hearty ingredients. Serving size 1 Package (326g).